Australia's first croc farm was established 1969 at Edward River on western Cape York. The farm is run by the Pormpuraaw Aboriginal community. They are very proud of their croc farm. Six people with skills in caring for croc hatchlings are employed there. The farm covers 30 ha of wetlands. There are about 5000 crocodiles on the farm. Every year staff collect eggs from 140 nests. Young crocs are grown to about 90 cm long. Each year 2500 young crocs are sold to the Cairns Croc Farm. The Cairns Crocodile Farm, 30 minutes south of Cairns, is the largest farm in Queensland. They have about 7000 crocs and 15 staff. 300 adult crocs breed in 15 acres of wetlands. Each year about 3000 eggs are incubated. Hatchlings are sent to Pormpuraaw to grow up. Then the Cairns Croc Farm takes young crocs from Pormpuraaw and grows them to skinning size. They produce about 3000 croc skins each year. Crocs build mound nests of vegetation and soil on the banks of river or lagoons, the female usually stands guard nearby. Crocs breed in their wetland habitat in Pormpuraaw. 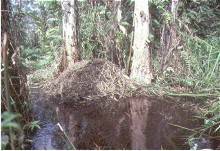 Females build nests from vegetation on the river bank. They lay about 50 eggs in each nest. Farm staff collect eggs from the nests soon after they are laid. This can be dangerous work because female crocs will defend their nests. The eggs are incubated for about 90 days. The temperature is important. Eggs kept at 31.6oC produce males. Temperatures any higher or lower produce females. the offspring are male or female. After about 90 days, the baby crocs hatch out of the eggs in the incubator. They are about 29cm long. Young crocs are put into special pens with running water and fed each day. They eat minced chicken and bull meat with vitamins. When the young crocs are about 30 cm long, they are moved to the Cairns Croc Farm by plane or truck. They are put into cement pools that can be shaded from the sun. Here the young crocs are fed fish, meat and vitamins three times per week. They grow to about 1.3m and then are ready to be shot and skinned. 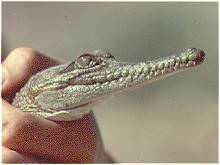 Baby crocs can squawk to indicate stress. Skins are removed then they are rubbed, salted and packed. Most of the skins are sold overseas to Europe and Asia. A croc skin can be worth anywhere between $300 and $800. Some skins are tanned in Australia and the dyed skins are returned to the Cairns Croc Farm. Here they are made into handbags, wallets, belts, key rings, head bands, pens, shoes, boots and watchbands. Crocodile meat has been eaten by some Aboriginal people for a long time. Today there is also a huge demand for croc meat from restaurants. It sells for about $20 per kilo. In this way, the croc farm is no different from a cattle or sheep farm.